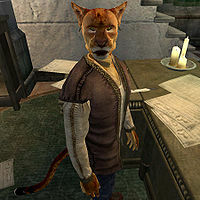 Urjabhi is a Khajiit scout living with his brothers, Ra'jiradh and Hassiri, in the Talos Plaza District of the Imperial City. The three of them jointly run the officially sanctioned publication, The Black Horse Courier, which is distributed throughout Cyrodiil. While both Ra'jiradh and Hassiri spend a lot of time running around the big city, Urjabhi mainly oversees the office in the Market District and can be found behind the counter on all regular weekdays (Morndas to Fredas) from 6am until closing time at 8pm. He then heads back home for a four-hour dinner with his brothers. On Loredas and Sundas, his routine will be different and he will, at 6am, eat an early breakfast above the main reception room and then head back home to the Talos Plaza mansion at 8am. At midday, he leaves and travels all the way to the Waterfront District where he enters the Bloated Float Inn and spends the next six hours in the company of innkeeper Ormil and the bouncer Graman gro-Marad. At 6pm he heads back home for a bit of wandering before his brothers return at 8pm and they all sit down for dinner until midnight. Due to the unfinished quest to do with Couriers, in which the three Khajiiti were supposed to play a major role, there are three exceptions to Urjabhi's daily routine. At 4pm on the 7th, 16th and 26th of every month, presuming that both Severius Atius and Hafid Hollowleg are still alive, Urjabhi will run all the way to Bruma and enter the Jerall View Inn for a quick encounter with Hafid. He will then run all the way back to the Imperial City and resume his normal life. When he is at work at the office and during his weekend visits to the Waterfront, he wears the rare zero weight rugged pants with quilted shoes and a brown shirt. On certain occasions, specifically during his trips to Bruma and while eating dinner, he equips a fine steel shortsword and a pair of chainmail greaves with a matching cuirass. He carries the key to the Talos Plaza house and a small amount of gold. When you approach him for the first time, he will explain that external writers pen the articles while the brothers do the publishing: "Urjabhi helps his brothers, Ra'Jiradh and Hassiri, to run the Black Horse Courier. Others write. We organize, we deliver. The news never stops!" When asked about the Imperial City he will add: "The Black Horse Courier brings the news of the people to the people. We are funded by the Empire, so our broadsheets are always free!" According to in-game dialogue, Urjabhi and the other Khajiiti he works with are his brothers. However, his faction states that he is in fact the brother only of Hassiri, and is actually Ra'jiradh's son. Urjabhi was supposed to sleep every night between midnight and 6am, but unfortunately, Ra'Jiradh claims ownership over the only available double bed, causing him to wander around on the ground floor all night. Esta página foi modificada pela última vez à(s) 23h52min de 19 de julho de 2015.